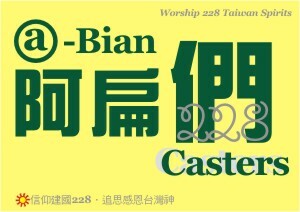 228 Tâi-uân-sîn(Taiwanese pronunciation of Taiwan gods) is a primordial faith beyond ethnic, political and religious boundaries, with freedom, democracy, human rights and rule of law as the core values, to put focus on Taiwan struggle for human dignity and independence. It’s a modern revelation unveiled through the great deeds of people sacrificing their lives in upholding these universal values against tyranny and oppression. 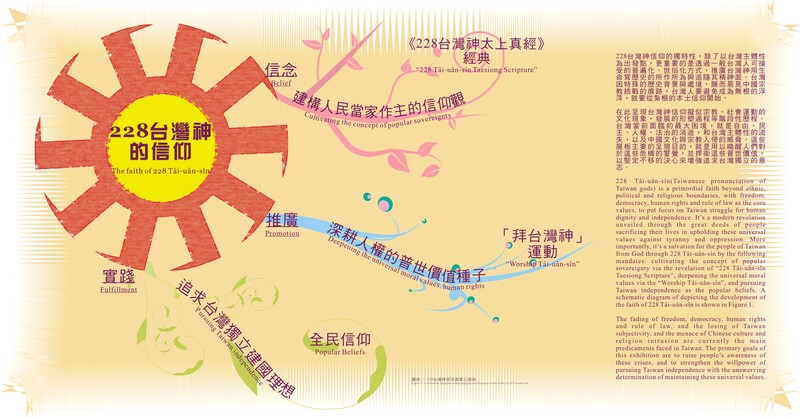 More importantly, it’s a salvation for the people of Taiwan from God through 228 Tâi-uân-sîn by the following mandates: cultivating the concept of popular sovereignty via the revelation of “228 Tâi-uân-sîn Taesiong Scripture”, deepening the universal moral values via the “Worship Tâi-uân-sîn”, and pursuing Taiwan independence as the popular beliefs. A schematic diagram of depicting the development of the faith of 228 Tâi-uân-sîn is shown in Figure 1. The fading of freedom, democracy, human rights and rule of law, and the losing of Taiwan subjectivity, and the menace of Chinese culture and religion intrusion are currently the main predicaments faced in Taiwan. The primary goals of this exhibition are to raise people’s awareness of these crises, and to strengthen the willpower of pursuing Taiwan independence with the unswerving determination of maintaining these universal values.